Agate is known the pictures and colouring. Variety of fine-fibre chalcedony, semilucent variety of quartz. Chalcedony is the greyish semilucent oxide of silicon with a cryptocrystalline structure (consisting of the thinnest fibres, distinguished only under a microscope). Formation of agates takes a place in emptinesses of volcanic rocks. At weathering agate amygdales free oneself from containing them less durable rock and accumulate in mineral deposits. Colouring from yellow, orange to red, brown and black him gives iron Fe, the green colouring is given by chlorides. Risunchatye or stratified Chalcedonys - it and there is Agates of the most various tints (the natural painting is in a stone), in him also can meet in rhythmic alternation layer after a layer: Chalcedony, Quartz, quartzine and opal. 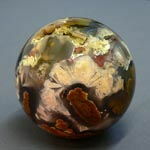 Including of other minerals give the variety of colouring of layers of this stone. 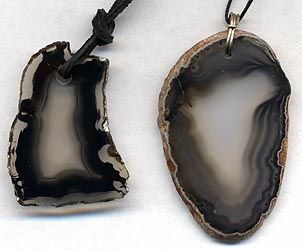 A zigzag picture has Agate, parallel striaes form an onyx. 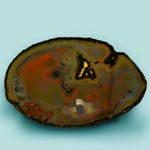 Including of oxide of manganese is given by the picture of tree (dendrite Agates). Admixture of manganese, contained in Agate, represents the branches of separate trees or bushes painting of niello. 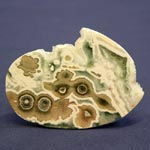 Mossy Agate has visual inclusion, look like a road clearance on moss. If the green admixtures of chlorites or actinolite enter in the complement of Agate, then a picture changes. We see the colourful green forest, ferneries or moss, among which it is possible to see pet lakes. On some thin transparent plates of Agate moss as if stretches from the bottom of lake to the sunbeams, to pushing through through the thick layer of ice. 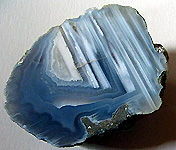 Blue Agate - it sapphirine. 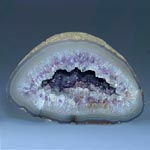 Stratified Agates usually formed in natural cavities (geodes) and can repeat the contours of this cavity the picture. 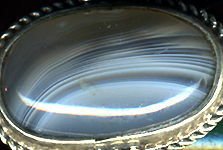 At eye (glasses) agates concentric circular layers are disposed round a central point (this point can contain a few crystals of mountain crystal), it most valuable Agates. In some agates in an area the width of 1 sm can be a few thousand different layers. Natural Agates not very much bright, usually greyish or reddish, but well absorb synthetic dyes. Painted Agates differ an ever-higher brightness and chromaticity. More dense (milk) layers absorb a paint weaker, more transparent - stronger. 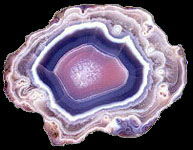 Agate - one of the most beautiful and popular stone among chalcedonies. Good-looking foliation, striation, formed layers breadthways from the stakes of millimetre there are to a few millimetres, thin colour transitions, saturated palette of colouring of this stone is all of does him extremely attractive. Different wares from Agate are known from deep antiquity. The deposits of agates are widespread everywhere. 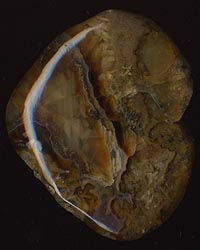 The important source of booty of agates are mineral deposits. 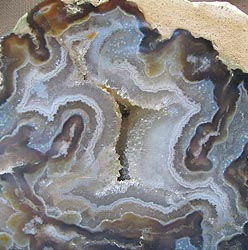 The origin of agates is related to the volcanos complexes of rocks: by lavas, tuff, tuffbreccias, where amygdales appear. In emptinesses there are layers of different color because of penetration of solutions through a colloid gel matter, presented a silica. Each, who is interested in semiprecious stone, knows that other stone it is impossible to entangle with Agate. From all of varieties of chalcedony Agates have the most attractive pictures of the most various flowers. 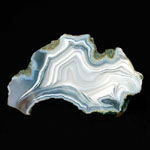 Agate - one of not many minerals, for creation of which nature attached a lot of fantasy. The variety of color and form of lines is given standards uniqueness, and to many of them is an unicity. Due to a beautiful picture and multicolouredness of Agate always found a wideuse. Often there are agate geodes (cavities), filled the crystals of mountain crystal (crystalline quartz), Amethyst with other including. Nature gave a present us yet more beautiful stone. By volume form him consists of Agate and chalcedony, and inwardly there is a cavity (geode), filled the crystals of violet Amethyst or mountain crystal. Forming Druse of extraordinary beauty, crystals decorate these unique standards uniquely, demonstrating beauty and unity of semiprecious stone. There is a special variety of Ural Agate on Russia (CIS) - chalcedony perelivt, in which the layers of chalcedony as though flow whimsical streams and striaes, and a color overflows from white and bluish to rather yellow, orange and red. The special fame was got by shaitan chalcedony perelivt - very beautiful figured multicoloured stone. 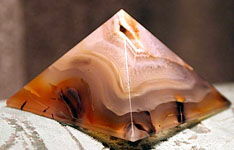 It is considered that a people can find Agate only clean, hight moral. Giving of Agate is caused by liking for a grantor. 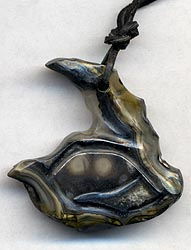 This stone is an amulet from the bites of poisonous creatures, rescues from "toxicity" of different essences and so "poisonous" people, guards enemies from intrigues. Agate is a talisman, bringing ability it is beautiful to talk and accept correct decisions, accomplish correct selections and acts, it strengthens reason and does a people penetrating. 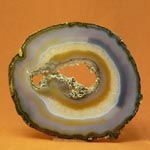 Agate is instrumental in development of talents and gives a confidence a proprietor. Especially he is good for artists, aspiring to perfect the creation. 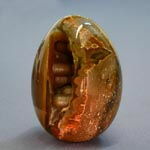 Brown Agate brings a proprietor invincibility in vital situations, instrumental in love, to friendship and put righ mutual relations; it also conduces the owner to riches and glory. Instrumental in development of internal "Ci" and gives a confidence a people. 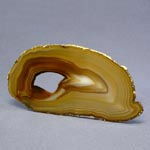 Lamas have a popular belief - yellow, gold Agate banishes from dwelling and body of people of wicked perfumes. It is recommended to carry decorations with Agate on a left arm. 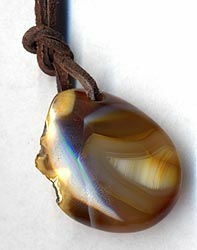 Agate is an amulet of Tauruses and talisman of Gemini (as helps to overcome them bad character traits). White Agate contains the lines of Moon, Venus, Saturn, therefore considered the stone of the world and calmness, and used as an amulet from influence of forces wicked. It is instrumental in that kindness, mildness, calmness, confidence in own forces, showed up in a people. It is recommended women to carry him in ear-rings. 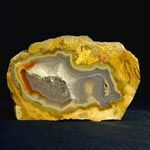 In yellow Agate consistently united Venus, Mercury, Saturn. It also stone kindness, mildness, calmness, stone, cooperant prosperity of house, strengthening of family, acquisition and accumulation of knowledges. From ancient times considered the stone of educators, a finger-ring with him always carried teacher (guru). His healthful qualities affect bodily condition of people, on returning and conservation of vital energy. 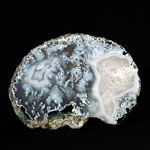 Grey Agate - stone of honest people, it helps to avoid false situations, protected from deception. Pacifies a spite, evens quarrels and conflicts, restores the world and equilibrium as between people. In him celled property of Venus, Mercury and Moon. 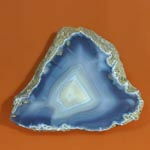 Blue Agate contains Venus, Moon and Uranium. In life those, who has him, it add the world and love, instrumental in different innovations, strengthens creative capabilities. It stone of active, active, creative people. It is not recommended to carry him constantly, it is periodically necessary to take off. This stone is very good for Water-carriers, Gemini and Virgo. It is not recommended lions and wild Goats. It is not other signs of contra-indications. Black Agate contains Venus and Saturn, stone - guarded, protecting a people from catastrophes and blackly-magic onslaught. It grants people large internal force, solidity of spirit, durability of morale and financial position. Instrumental in strengthening of vital position of people, helps him to be more serious and purposeful, does more steady and durable relationships with near people (immediate relative). Transformations of opals during an evolution: from an opal to chalcedony and Agate. In the process of evolution fully losing the water of disgrace and semidisgrace pass in Agate and Chalcedony, which are the final stage of evolution of all of opals. History of noble opals began millions of years back, when part of dry land was covered a sea, on the lagoons of which siltages were put aside. Rich in silicon water, tailings of plants and animals, was saved in cracks and emptinesses of these rocky siltages. Silicon slowly grew into an opal, in fact opal is silicic acid and water. In the process of senescence with the flow of millions of years an opal lost all of water, but can continue to be as the stratified chalcedonic and agate lenses, covered the brush of crystalline quartz, in the cavities of other rocks in which silicic acid was before saved and opals were formed (the final stage of senescence is down resulted opal: fissile thin-layer Agate, formed from an opal, a structure, demonstrating the process of the primary flowing and further forming of fissile, thin-layer Agate, is very well visible here). Opal can contain a to 21-35% water. 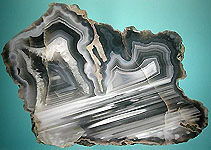 As far as a senescence and loss of water for millions of years the general volume of mineral diminishes gradually, chalcedony and Agate is formed on the edges of cavity, and in the middle of cavity emptiness, filled the crystals of quartz, formed as far as the gradual withering of solution of silicic acid, can be formed sometimes. If temperature terms during time change periodically, forming of Agate goes layers. Most beautiful Agates - irisation, with the remittent brightly expressed semilucent and sucklings skims.